One of the great pleasures of living in a rural area is being able to watch the land’s transitions through the seasons. The gold of summer yields to the spectacular colors of fall. Winter brings its many shades of white, in both land and sky. Spring is the miracle of watching the world turn from white to brown and finally to green, seemingly in the blink of an eye. In this show Winthrop Gallery artists offer artworks that show their awe and appreciation of the ever-changing landscape. 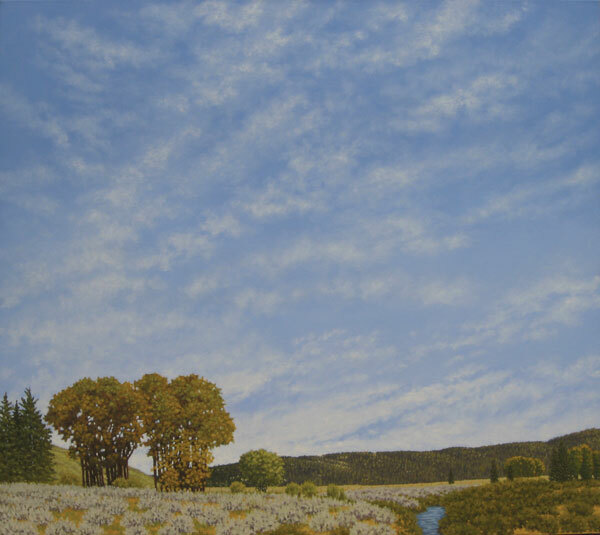 From still forests and mountain lakes to sweeping open spaces with a dominating sky, these views, expressed in paintings, drawings, photographs and more show an artist’s love for the land and sky that inspires them. DATES: Sept 13-Oct 16. A reception will be held at the gallery on Saturday September 16, from 5 to 7pm. Refreshments will be served. LOCATION/HOURS: The Winthrop Gallery is located at 237 Riverside in downtown Winthrop. Hours: During September the gallery will be open daily from 10am to 5pm. In October the gallery will be closed on Tuesdays and Wednesdays. INFO: 509-996-3925, www.winthropgallery.com.